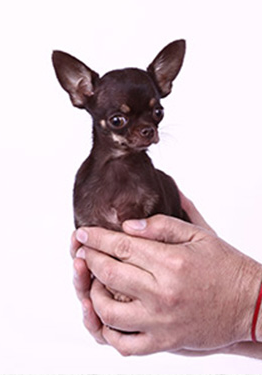 The world's smallest dog according to Guinness World Records is a 2-year old Chihuahua from Puerto Rico. Milly stands 3.8 inches tall when measured from backbone to paw, and weighs around 1 pound. She is shorter than a soup can. When she was born, Milly weighed less than an ounce and fit in a teaspoon. She was too small to nurse from her mother, and the family gave her milk every two hours through an eyedropper. Today, she eats twice a day, and prefers salmon and chicken. The smallest dog in terms of length is also a Chihuahua. Brandy lives in Florida, weighs two pounds, and measures 6 inches from her nose to the tip of the tail. I can't imagine! Mom has trouble with 20 lb dogs being so small! Yikes! I'd be so worried about losing the dog, stepping on it, sitting on it... Tiny! Yes... While it would be cool to have a really small dog that could come with me everywhere I think I'd better stick to the big ones.